Not your ordinary motor maintenance company. 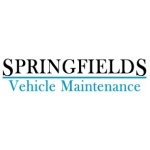 For friendly advice, reliable and effective service, contact Martin Prout's team at Springfields Vehicle Maintenance. Years of experience in the world of Motor Racing has equipped Martin with the know how to help you with your motoring problems no matter how major or minor. His well qualified team can get to the bottom of most problems and explain it all to you in a friendly non patronising fashion. diesel tuning. which is power and econnomy enhancement.